All too often the news reports about marine species are grim: We read about declining fish stocks, illegal and unregulated fishing and the increasing degradation of coral reefs. Why is this happening? What factors motivate fishing practices that create such harmful outcomes to our precious marine resources? Fishermen are often on the losing end of global trade, facing low market prices and lack of tools to improve resource management. Fair Trade USA believes there is a missing piece to this complex, yet critically important and ever-evolving puzzle – that we cannot have truly sustainable seafood unless we make sustainable livelihoods for fishing communities a top priority. We believe that Fair Trade can be part of a larger effort to make wild-caught seafood better for people and planet. 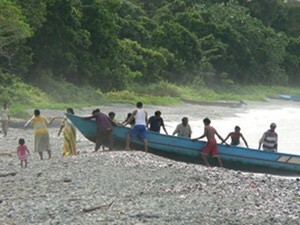 In 2011, global exports of wild capture fish from developing countries reached USD $34.5 billion. An estimated 120 million people are working in primary and secondary fish livelihoods, and more than 90 percent of the world’s capture fishermen are employed in small-scale fisheries. Like their developing country counterparts in agriculture, many fishing communities struggle against fluctuating market prices, limited direct market access and unregulated working conditions. Furthermore, with many fisheries under inefficient or limited management, fish stocks and marine species are dwindling at an ever-increasing rate. Fishermen are, quite simply, struggling to make ends meet, and they rarely have enough resources and incentives to engage in sustainable fishing practices. How can Fair Trade help? The pioneering work of groups such as the Marine Stewardship Council (MSC), Monterey Bay Aquarium’s Seafood Watch program and Fishery Improvement Project providers has been instrumental in building the sustainable seafood movement and raising consumer demand for responsibly-harvested seafood. Fair Trade USA is excited to offer a complimentary approach to the current sustainable seafood programs, with a focus on social and labor rights, working conditions and economic incentives that inspire better resource management over time. Perhaps best known for certification in coffee, Fair Trade is a market-based approach to improving the lives of farmers and workers, protecting the environment, and delivering quality and safety. At its core, Fair Trade puts people at the center of sustainability. We believe the key to sustaining healthy communities and stewarding the globe’s fish species is to create tools and improved market access in partnership with hardworking fishers, seafood buyers and mindful consumers. How will fishing communities benefit from Fair Trade? Fair Trade certification will provide a framework for fishermen to organize into self-empowered associations, improve their business skills, access premium markets and steward their marine resources. In addition, fishermen will receive extra financial premiums to devote to community development projects in areas like education, healthcare and infrastructure. Since 1998, Fair Trade producers for products around the developing world have earned more than $153 million in community development premiums. Harness the purchasing power of consumers to increase financial returns for those employed in the fishing sector. When will Fair Trade seafood be available? The world’s first Fair Trade Capture Fisheries Standard is nearing completion, having just finished a public consultation period. With our partner, Anova Food, LLC, we are field testing the program with a handline caught yellowfin tuna fishing community in Indonesia. We are working with retailers and consumers in North America to cultivate the market for Fair Trade Certified seafood. It is our hope that the results of this work will benefit small-scale fishing communities and the natural environment upon which they depend. Fair Trade USA welcomes the input, participation and support of a variety of stakeholders in the marine sector. For more information on how you can get involved, please contact fisheries@fairtradeusa.org. Maya Spaull is Director of New Category Innovation for Fair Trade USA.